At first glance, it might seem like the standard bicycle doesn’t have much you could improve on. It gets you to your destination faster, provides a great workout, and doesn’t pollute the air. And, of course, once you learn how to ride a bike, you never forget. However, in sprawling modern day cities—Los Angeles, we’re looking at you—bikes are sometimes less than ideal as a form of transportation. Cyclists can certainly brave the crowded streets and longer commutes, but they’re far more likely to be exhausted, or at least uncomfortable, at the end of their ride. That’s where the electric bike comes in. Electric bikes, or e-bikes, have been around for a few years, but a recent increase in popularity has thrust them into the spotlight—and for good reason. As more and more people move to urban areas, we’ll have to find new ways of creating urban mobility if we want to stop problems of traffic congestion and air pollution from becoming worse. The electric bikes provides an excellent solution to this problem: by making commutes less intensive, it serves as a viable alternative to cars and lets riders enjoy their time outside and explore their city. Here at Inhabitat, we decided to test out an e-bike for ourselves to see just how different it was from a standard bicycle. 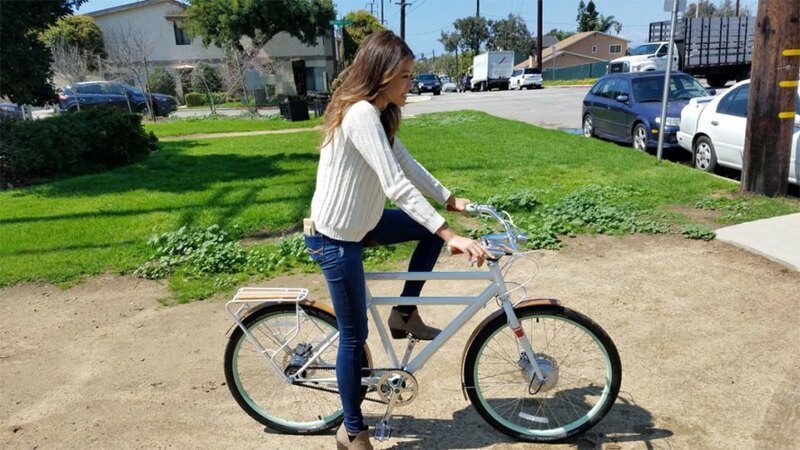 On a typically sunny SoCal day, I headed down to Electric Bikes LA in El Segundo, a small suburb south of LAX, and picked up a Porteur Faraday bike. The bike itself was gorgeous, painted bright white and mint green, with sleek bamboo fenders above the wheels. The battery, which can last 25 miles when fully charged, was cleverly integrated into the frame of the bike. At the very least, I thought as I wheeled the bike out the shop’s front door, I would be riding in style, and nobody would know the bike was electric. I took the e-bike to a nearby park, then started out on a rutted dirt path. At first, I found I had to pedal a little harder than usual. Electric bikes weigh more than standard bikes, though, at 40 lbs, the Faraday models are much lighter than other brands. Once steady, I reached down with my thumb and switched the motor to full speed. And even though I had read about electric bikes and what they could do, I was not at all prepared for what happened next. Imagine flooring it in a car—the way the vehicle leaps forward, the landscape on either side turning to a blur. It was a little like that, except all I had to do was pedal, and instead of going from zero to sixty, I felt the bike comfortably pull me forward as I went from zero to twenty. Even so, I let out a whoop as I shot effortlessly through the park, then slowed down with ease and turned onto the street. Once I joined traffic, I dropped the motor speed down a notch, but that didn’t stop me from outpacing the cars beside me. I even spotted a few of the drivers giving me incredulous glances as I sped past. Granted, I was on residential streets, but I could understand—it’s not often that you see a cyclist pass a car without even breaking a sweat. As I navigated around El Segundo, I toggled between speeds, testing out various combinations. The motor essentially functions as a gear shift, allowing you to pair each setting with gears one through eight. 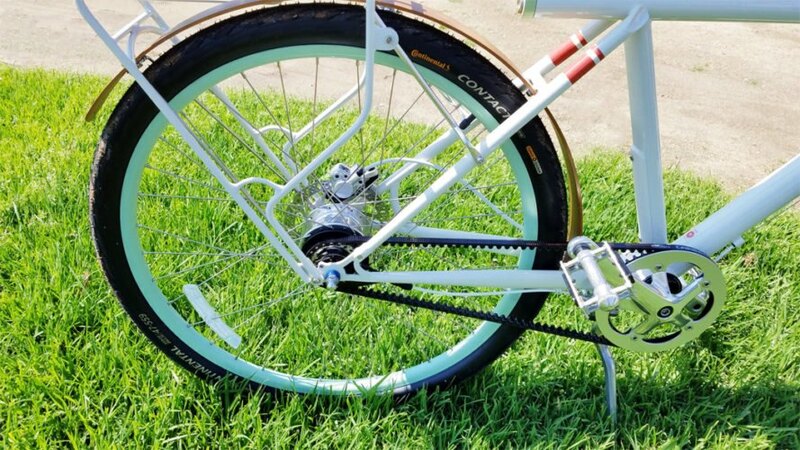 The bike itself uses a Gates carbon drive belt that not only means less long-term maintenance, but also no greasy pant legs and a quieter ride. I found that the bike shifted seamlessly based on whatever speed I desired, which allowed me to pedal less while maintaining momentum. But I knew there needed to be one more test: the hill. 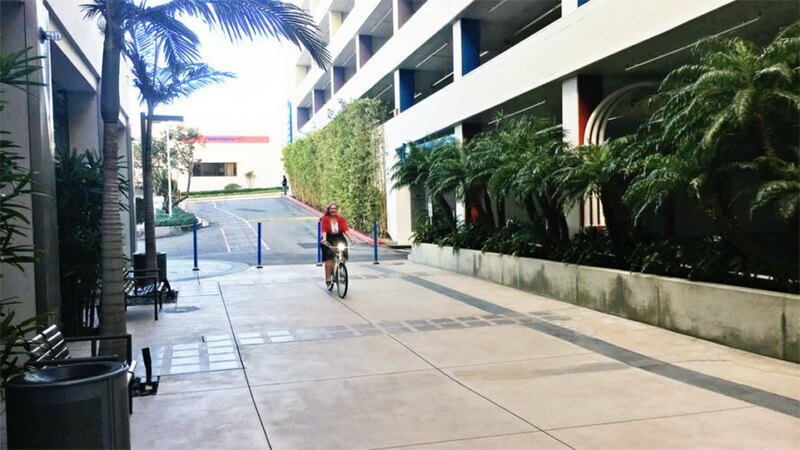 El Segundo’s elevation changes aren’t exactly staggering, but still, I figured getting a 40-pound electric bike up a hill might take some effort. I tried it twice, only turning on the motor the second time. The first time, I have to admit that I was huffing and puffing by the time I got to the top. The next time around, I flipped on the motor and went up two gears, and I ascended the hill in about half the time, pedaling with ease. Once I got back home, charging the bike was a simple process. The adapter is about the size of a typical laptop charger and plugs straight into the battery pack. From a completely empty battery to full charge took around two and a half hours. The verdict? 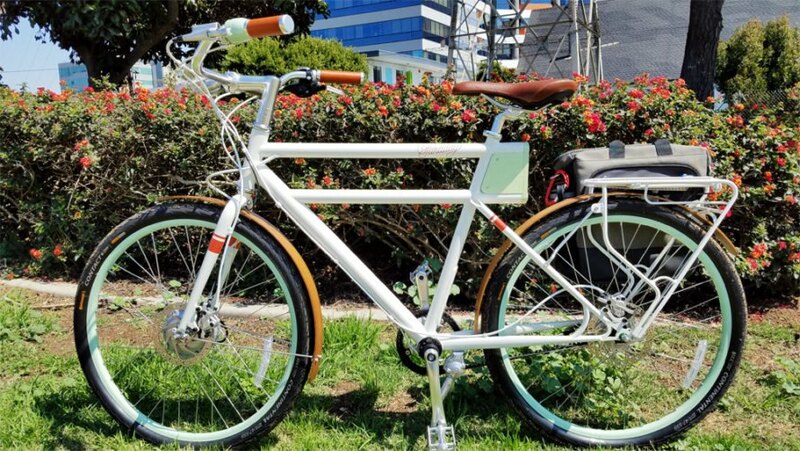 Faraday’s electric bike handles and rides like a dream, and it’s easy to imagine using it to commute in L.A., or any city, really. In fact, Los Angeles is just one among many cities where it can be faster to ride a bike than drive. An electric bike isn’t exactly cheap—the average retail price in 2016 was $3,000, and Faraday’s two models go for $3,499 and $2,499—but, as an alternative to other forms of transportation, it makes sense. Faraday itself offers a 24-month financing plan that knocks the price down to $104 a month, which is about the same price as a bus or metro pass in most major cities, and far less expensive than paying for gas and insurance. Plus, you have the added benefit of appreciating and experiencing your city rather than seeing it through a car window. While the concept is still relatively new, I don’t doubt that electric bikes could be on the rise as a transportation alternative—one that’s greener, faster, and much, much more pleasant than sitting in traffic. Nice but you're not doing bikes and/or cyclists any favors when you ride without a helmet! The electric bike, or e-bike, provides an energy-efficient, environmentally friendly alternative to automobiles. Weighing in at around 40 pounds, e-bikes from Faraday are both stylish and efficient. E-bikes let you enjoy your time outside and explore your city. 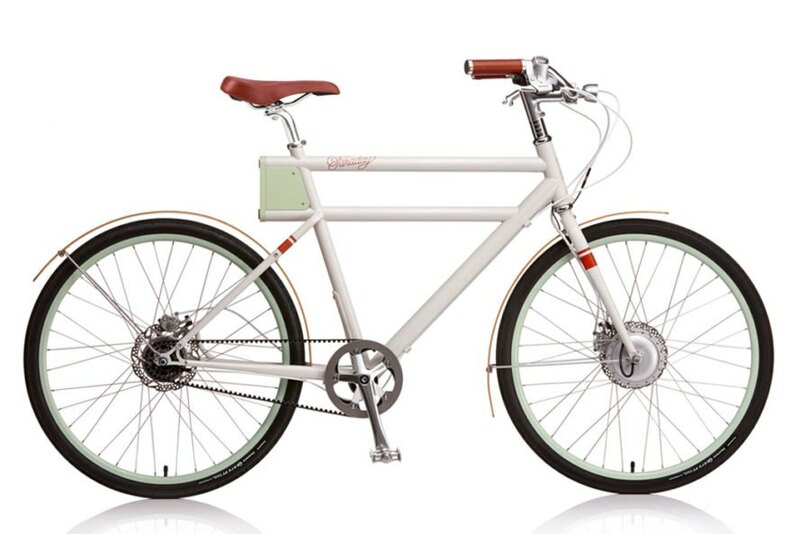 The Faraday Porteur e-bike is white with light green accents and bamboo fenders. The bike's electric motor pulls you forward as you pedal. The Faraday Porteur uses a Gates carbon drive belt that not only means less long-term maintenance, but also no greasy pant legs and a quieter ride. 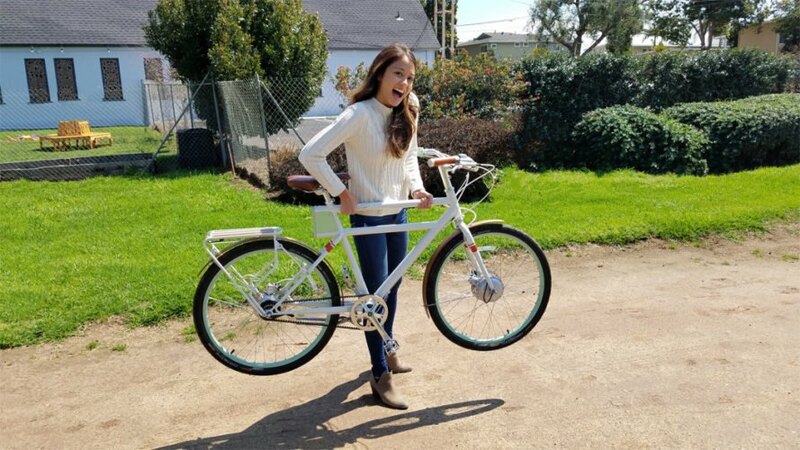 Faraday’s electric bike handles and rides like a dream, and it’s easy to imagine using it to commute in L.A., or any city, for that matter. An e-bike provides a more pleasant alternative to sitting in traffic.